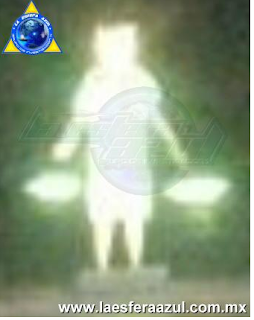 On March 20, 2013, a highly interesting and controversial event occurred: photographs of 3 luminous entities at the place known as Plaza Fundadores in Playa del Carmen, Quintana Roo, Mexico. These images were taken by Ernesto Z. Ortiz, a known professional with a master’s degree in Regional Development and Sustainable Tourism, a Nicaraguan national who has lived in our country for a long time, residing at Playa del Carmen. He is also the leader and founder of an NGO that supports the ecology. His probity and honesty are therefore assured. Upon hearing of his photographs we took it upon ourselves to contact Ernesto, who very kindly spoke to us, agreeing to an interview to explain the images. It should be mentioned at this point that the main goal in taking these photographs to obtain night photographs of the impressive archway that represents two intertwined mermaids that are found in Plaza Fundadores itself. However, much more than that was obtained: it should be noted that those strange luminous beings were not visible at the time the photos were taken. They only became apparent after the images were inspected. Thus, we also performed an in-depth analysis of the photographs we are including in this special report. Salvador Mora: It is a pleasure to speak with Ernesto Z. Ortiz in this special interview about some extraordinary photographs taken recently, showing strange beings that put forth light from their bodies, and who better than Ernesto who discusses them with us. First of all, many thanks for your willingness to participate in this interview, Ernesto. How are you? Ernesto Z. Ortiz: Fine, thank you. Startled by what we were able to see in these photos. Salvador Mora: Absolutely. Where were these photos taken and where? Ernesto Z. Ortiz: These photos were all taken on March 20 of this year, 2013. SM: Where were they taken and at what time? 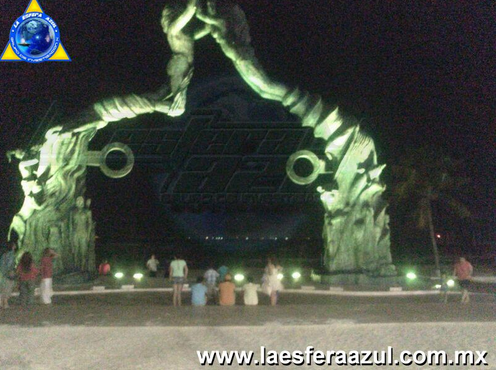 EZO: At Plaza Fundadores in Playa del Carmen, around 9 at night near the beach. SM: We are interested in the sculpture there. What does it symbolize? SM: Very good. On a personal level, did any unusual events occur before or after these photos were taken at the site, or something similar to be remarked upon? 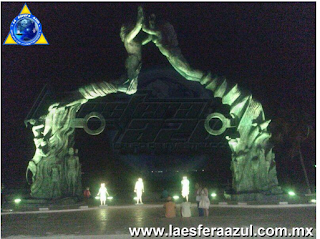 EZO: The monument was dedicated on December 21 . Well, some strange things happened to us around that time. SM: OK, very interesting. What happened? EZO; Well, in subsequent days, one of our co-workers claimed to be possessed by a supernatural being that wasn’t him. In fact, when he was possessed, he would act entirely different. He would speak as though he was just learning to speak and walked in the same way. Days later, a young lady drowned in the beach, and in the photograph we saw something like blankets hanging in the air, in the shape of the Grim Reaper. The girl was found at the only spot where the sun shines on the beach. SM: Extremely interesting. Had similar events occurred at this site, or had any video or photograph been taken of anything like the image? EZO: The girl was found at the only spot where the sun shines on the beach. Not to my knowledge. A holistic event took place near that beach – meditations, cleansings of various kinds, vibrational music using hompax and crystals. SM: Very interesting. How distant from the edge of the beach is the place where the light beings were photographed? In the following analyses we could ascertain the complete authenticity of the photos. No hoaxing or anything similar was noticed, and it should even be mentioned that we shared these images with Hernán Bado for analysis and opinion. He is one of the best and internationally renowned analysts of images with out-of-the-ordinary beings. He reached the conclusion that the luminosity put forth by the entities is such that no further information could be obtained about their details or features, as has occurred in earlier occasion. But let Hernán Bado himself discuss this matter in detail so we may show the images in depth. Hernán Bado: Hello Salvador, always a pleasure. I’m writing to tell you that I have worked on the “entities” in the photo and have unfortunately been unable to obtain results. The whiteness or luminosity is too intense and there is no way of penetrating it to decode the reality of who or what is there. At a given moment I thought that there might be something there…but in fact, I wasn’t able to confirm anything. I regret the delay and the outcome. Regards. Salvador Mora: OK, Hernán, don’t worry about it, many thanks. Let me ask you – was this possibly due to the fact that the luminosity was so intense that it was hard to see what was behind it in any detail? Hernán Bado: Yes, that’s exactly what’s going on. All of the figures have a very intense luminosity. This light also has a characteristic that is worth discussing, which is a slightly more yellow border, appearing to function as an aura of the figure it surrounds. The upper part, or whatever corresponds to what would be the head, is subtly darker than the lower part corresponding to the clothing, which is decidedly whiter. The three figures are standing on one of the small pedestals surrounding the fountain and this strikes me, because there appears to be an effort to imitate something like statues. In short, that’s all I can say about it. Regards. SM: OK, thanks Hernán. We can then say these could be beings of light of a highly intense luminosity, so intense that seeing their features becomes very hard. Conversely, we are faced by a very interesting case. Thanks again, Hernán. We’ll keep in touch. A very good observation, which at first may be a mere curiosity, but there could also be some symbolism in this case: the fact that one night after Ernesto Z. Ortiz visited Plaza Fundadores with the purpose of taking comparative shots, since he was still amazed by the originals, he noticed that the Mayan number six (6) was forming between the Moon and the clouds. A coincidence? Symbolism? We do not know. We can only provide a photo of this, taken by Ernesto himself, right next to a comparable image. A highly interesting case which we are sure will draw the attention of many, prompting consideration. Based on the investigation performed, we can say that it could well be one of the most cogent pieces of evidence attesting to the existence of these strange luminous entities.